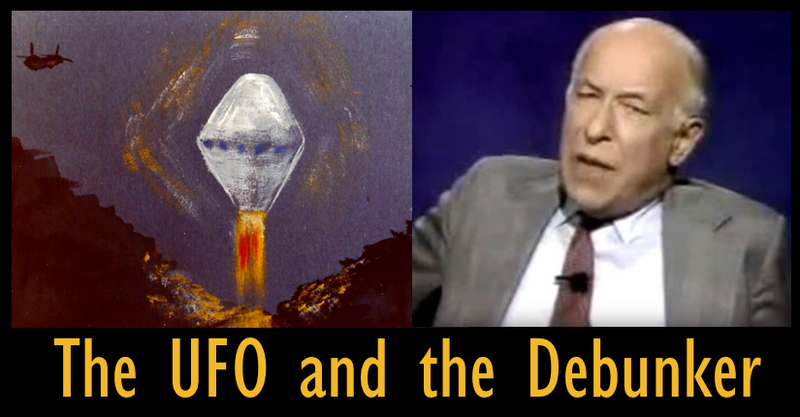 Philip J. Klass (1919 – 2005) needs no introduction to most buffs, as he was the most prominent debunker of the UFO topic. Klass was an engineer by profession who went on to become the senior avionics editor of Aviation Week & Space Technology magazine. In the mid-1960s Klass became interested in UFOs from a skeptical point of view, and in 1976 was a founding member of the Committee for the Scientific Investigation of Claims of the Paranormal, known today as CSI, the Committee for Skeptical Inquiry. 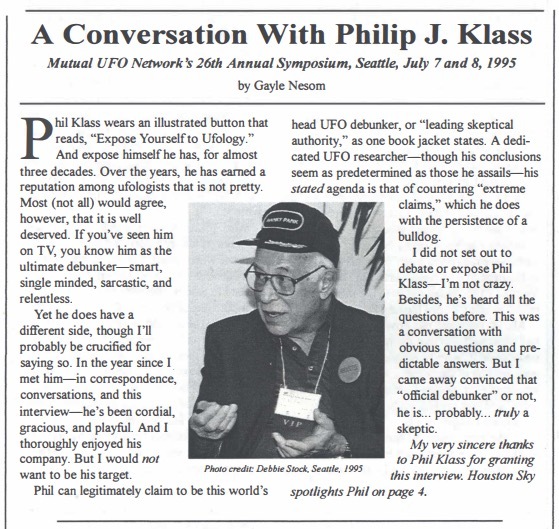 Klass became actively involved in the UFO topic, he attended conferences, was frequently quoted in the media, and wrote seven books on the subject. However he thought ufology was mostly filled with the gullible and frauds, promoters of pseudoscience. In the early 1980s, the Cash-Landrum story was the biggest UFO case, so naturally it caught the interest of Klass. The American Philosophical Society was the beneficiary of Klass' files and it includes over 200 pages of his correspondence and news clippings and on the case. Klass wrote to investigator John F. Schuessler who considered the inquiries to be accusations, allegations, and harassment, so he seldom responded. However, the documentation shows Klass asked logical questions, no more invasive than if the case had been taken to court, just as Schuessler and the witnesses desired. Klass had a more mutually cordial relationship with other people involved, such as Lt. Col. George C. Sarran, who conducted the investigation for the DAIG and Peter A. Gersten, the "UFO Lawyer" in charge of the legal case for Cash and the Landrums. The distinguishing feature of the Cash-Landrum case was the alleged physical after-effects, which should prompt a UFO investigator to begin by talking to the family physicians of the principals to determine if they had shown any of the symptoms... prior to the alleged incident... Although Schuessler has written several articles on the case over a two-year period, he has never included any details on the health of the two women prior to the alleged incident. "I believe the story is a hoax. There is absolutely no evidence. The women’s story is supported only by the claim of Betty Cash that she had serious health problems after the alleged incident." Shortly after the show aired, Christian Lambright interviewed witness Vickie Landrum at her home in Dayton Texas. She offered a rebuttal, "Phil Klass makes me sick." Klass continued to express his doubts about the case over the years. The following is the Cash-Landrum portion of a 1995 interview with him by Gayle Newsom. The AFU (Archives for the Unexplained) hosts the online collection of Houston Sky, “A Bimonthly Newsletter for Houston-Area MUFON Members and Others.” The entire interview can be found in Houston Sky No. 6, Aug./Sept. 1995. GN: What do you think happened in the Cash-Landrum incident? PK: Well, shortly after it happened, I wrote John Schuessler to ask when we could see a statement of the ladies’ doctors about their medical conditions before the incident. His response was, "Read my next MUFON paper." When the next MUFON paper came out, there was nothing about their previous health conditions. So I wrote him again, and then he replied that they considered that very personal and an invasion of privacy. I said, wait a minute... If their health was excellent before and they are willing to discuss their ill health now... If it had been the reverse and you said, well, here is a report on their health condition before, which shows they were in perfect health for their age, but it's an invasion of privacy to ask about their health now - that I could understand. So until such time as John Schuessler and the people involved agree to release the medical records of their condition before the incident, I just can't waste time with it. That's my position. GN: But that's skirting the issue. PK: Supposing I was to charge that after this interview with you I came down with AIDS, or excess cholesterol, and sued you. Would your lawyer ask to see my medical records before our meeting to find out if I had high cholesterol or AIDS previously? Wouldn't that be rational? PK: I even saw the UFO from Washington, D.C. I was out that night, and I could see it way down in Texas. PK: No, that is a fundamental. If their health condition was excellent, then there is absolutely no reason I can see not to release the records. But, number two: 15 years have gone by. If these ladies were irradiated, I would presume they died of leukemia long ago. Are they still alive? GN: They are, but neither one has worked since. And Betty Cash has had breast and skin cancer. PK: Betty Cash had complained about hair falling out. If she had taken chemotherapy before the incident, that could well be explained. GN: What you're saying is that she may have had chemotherapy a month or week before the incident - or six months before? One of the problems I have is that you try to undermine witnesses without addressing other aspects of the case. PK: Let me ask a personal question. Have you ever told a lie in your entire life? PK: Do you know anyone who could honestly say they have never told a lie? GN: Betty Cash was a fundamentalist Christian. That was her only explanation of what it could have been. PK: Was that what she said she saw, or not? GN: That's the way she perceived it, and that's what she reported. PK: So maybe Jesus was flying a flying saucer. Are you going to start saying, "Well, we've got to interpret, we've got to change what they said? so, if these people were irradiated from 10,000 yards, then the crew of the helicopters must have died of radiation long ago. They were much closer. And if 22 helicopters, each with a pilot and co-pilot - to say nothing of other crew - if four people from a helicopter squadron all died, surely we'd have heard of it. I don't dismiss the possibility that there is intelligent life elsewhere and that they may have nuclear bombs. But if this is true and the government knows, then as of 1980, I would have expected all-out government effort to develop defenses against UFOs, especially in the form of some high-energy lasers. But I know from having followed such programs that there was no such effort. I can only assume that if this was an extraterrestrial nuclear weapon and if the government knew, then we have many, many derelict officials of that government and every government. *Phil Klass was wrong about Betty or Vickie "seeing Jesus Christ." The witnesses claimed they thought they were experiencing the Biblical Judgment Day. 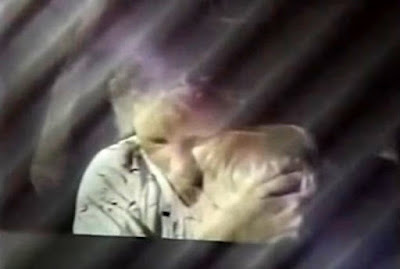 What Vickie Landrum actually reported was that when comforting young Colby, who was frightened by the UFO, "I got back in the car and took him in my arms. I told him it might be Jesus coming after us. If he saw a Man not to be afraid, He would be coming to carry us to a better place." There were no claims of an actual Jesus sighting, and at no time did the ladies characterize the object as a "flying saucer." According to their story, once they saw the helicopters pursuing the UFO, they rationalized the object as a military aircraft project. Aside from that, the rest of Klass' concerns and criticism of the Cash-Landrum case remains valid. There was certainly a lack of transparency in the Cash-Landrum case, and part of that was explained by Schuessler as the need to guard evidence that would be presented in the legal trial. The case was dismissed in 1986 due to lack of evidence and no trial was ever held. Even after that the case information was withheld from independent review, which has done much to preserve the mystery and controversy surrounding the case.